What did you do after high school? Did you go to a “college?” Or was it a “university,” “institute,” a “normal school,” or maybe a “professional school?” For generations of ambitious Protestant missionaries, the Moody Bible Institute in Chicago has been the best-known institution of evangelical higher ed. So much so that MBI has clung to the “BI” name much longer than many other evangelical colleges. I just rolled into Chi-town on the last of my research trips this year. As SAGLRROILYBYGTH are well aware, I’m working on a book about the history of evangelical higher ed. This year, I’ve traveled to Bob Jones University, Wheaton College, Biola University, Gordon College, and Liberty University. MBI is last, but certainly not least. I’ve logged my share of time in these archives over the years, especially while working on my PhD dissertation and first book. MBI is not the oldest Bible Institute, but it has remained far and away the most influential. For those outside of the orbit of evangelical culture, the primary goal of Bible institutes has been to provide quick and affordable education for missionaries. In order to serve effectively on the mission field, many evangelicals have believed, missionaries need a thorough knowledge of the Bible. In order to bring people to true salvation, missionaries need a proper knowledge, too. Beginning in the late 1800s, Bible institutes popped up in American cities nationwide. Many of them attracted students without a lot of academic preparation. These students, after all, were not heading into the traditional professions, but rather heading out to spread the Gospel in every land. They did not need to know Latin and trigonometry, but rather only the Bible and maybe some basic medicine and language skills. Over the decades, many of these Bible institutes turned into colleges or universities of one kind or another. This was part of the triple revolution in higher education that Roger Geiger describes in his new book, The History of American Higher Education. By 1940, Professor Geiger argues, the wild diversity of early institutions of higher education had become standardized, a recognizable modern system of American higher education. In this system, no one went to college without first completing a high-school education. They looked forward to an education that would prepare them for specific professions. Colleges themselves closed their preparatory departments or split them off into stand-along high schools. Universities had shaken out into a relatively stable hierarchy of prestige and social influence. At the top were wealthy old schools such as Harvard and the University of Michigan. At these universities, undergraduate education rollicked along in a cloud of sports, fraternities, and social climbing, while the schools themselves fought viciously to increase their research footprint. As this modern system regularized itself in the years after World War I, several types of institutions phased out. These evolutionary also-rans included many institutes of technology, proprietary medical or legal schools, “female institutes,” normal schools, and—though Professor Geiger doesn’t mention them—most of the Bible institutes. These old-fashioned types of higher education did not disappear. Rather, most of them changed to offer the new standard bachelor’s degrees. Many of them built new dormitories and fielded sports teams. And most of them took their place in the competitive hierarchy that arched from Harvard down to Podunk State College & Grill. A very few exceptions stood out from this winnowing process, at least symbolically. Some of the old-fashioned institutions of higher education had been so successful in the 1800s that they felt no need to change their names, even as they usually adopted some of the features of modern higher education. Most notably, the Massachusetts Institute of Technology never changed its name to call itself a “college” or a “university.” MIT began as one of a scramble of “institutes of technology” in the years surrounding the Civil War. Unlike today’s MIT, the early institutes did not focus on recognizably pure modern research. Instead, they mostly provided students with a more practical mechanical education meant for workers in industrial workshops. a change of name to one which would express the collegiate and theological work of the school. . . . It meant much to them as future Alumni. For some stand-out schools, however, these rules did not apply. 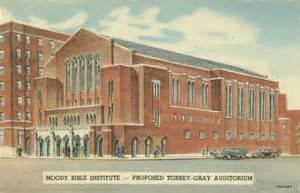 Moody Bible Institute was so well known among evangelicals its name sufficed to keep students coming. There was no need for it to change its name to acknowledge the changing environment of American higher education. Like MIT, MBI had created such a unique niche in higher education that it kept its old fashioned name and much of its old-fashioned structure. Also like MIT, MBI took on many of the features of modern higher education. Unlike in its early days, MBI now offers college degrees, not just Bible training. Doubtless, I’ll find some evidence here in the archives about efforts over the years to change MBI’s name. Unlike smaller schools, however, MBI had the size needed to stand out as an island in the new seas of modern higher education. From the Archives: What’s a Popular Fundamentalist to Do? A category of college you left out are the numerous sub-ivies like Dartmouth and Oberlin and many others that were originally religious, sometimes missions or clerically oriented, and in some cases (like these two) headed by early American old earth Creationists. I agree that Moody’s print and radio presence had a big impact on extending Moody’s reputation and influence. Indeed, according to early reviews, Timothy Gloege’s new book about MBI emphasizes precisely that aspect of “brand-building” by Moody.